The Division of Water Quality (DWQ) responded on August 1, 2018, to reports of a bloom on the Bear River. 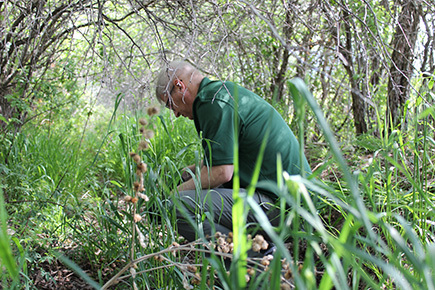 The monitoring crew observed a thick bloom in the slow-moving river and met with the Bear River Health Department to coordinate efforts. The crew collected two samples from the Bear River near Corinne: one surface sample and one elbow-depth, integrated composite sample. Strip test results were non-detect or invalid for anatoxin-a and microcystin. 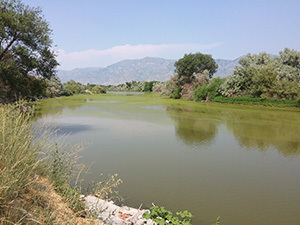 Sample analysis by the Utah Department of Agriculture and Food (UDAF) lab found <0.1 micrograms per liter (µg/L) of microcystin in the surface sample and 0.1 µg/L in the integrated sample. Both sample results fall well below the recreation health-based threshold. DWQ is waiting to hear back from the lab for cyanobacteria cell-count concentrations and taxa identification.